Would love to see an "Ottoman-Russian Update". White pants would be the best fit tbh. It's the parade uniform of junior officer of the 1st "ships’ équipage". Apparently officers wore the forage cap when aboard ship, which is weird. I suspect but have no proof that carpenters were petty officers and thus dressed in a gussied-up version of the sailors' uniform. I don't know why you think the army surgeon would have to be reused. Because I have looked and looked, and have not found a naval officer's uniform anywhere on the internet, or any mentioned in a book. Because I have looked and looked, and have not found a naval surgeon's uniform anywhere on the internet, or any mentioned in a book. Trust me I've been looking for Naval Uniforms for hours. Naval surgeons, to my knowledge, wore the same uniform as that officer but with silver embroidery (I also imagine the buttons were white metal) and no epaulettes. Medical personnel in the navy as of 1805 had dark green coats with a single column of flat white buttons and silver piping and embroidery on the collar and cuffs (which would use the same patterns as other doctors in state service). Waist-coats (camisoles) and trousers were likewise dark green. Anyway, neither of the current naval surgeons actually wear their uniforms. There's no chance of the flag bearer being anything other than an infantry NCO. Jewish Cantonists ! yep must have! 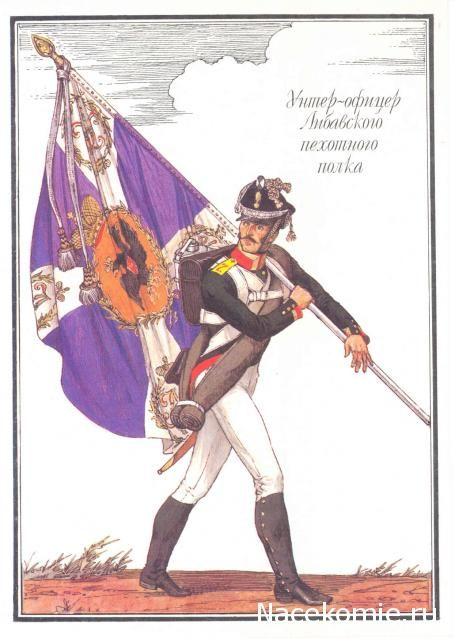 The cantonists and various corps cadets didn't do any fighting in the Napoleonic Wars. If not I would probably go with a Guard Jager regiment.